When it comes to nut butters, it's hard to beat peanut butter in popularity, considering that 90 percent of the kitchen cabinets stock peanut butter on their shelves in the U.S., according to The National Peanut Board. While peanut butter is a healthy choice as far as nut butters go, almond butter certainly gives peanut butter a run for its money. Comparing the benefits of almond butter to peanut butter could convince you that you need to make almond butter a staple in your pantry. Both peanut and almond butter are good sources of the heart-healthy monounsaturated fat. However, almond butter is a slightly better source, with 5.2 grams per tablespoon versus 4.2 grams-per-tablespoon in peanut butter, according to USDA National Nutrient Database. When part of a healthy diet, foods rich in monounsaturated fats may help lower blood cholesterol levels, according to the American Heart Association. They might also reduce your risk of heart disease and stroke. Like monounsaturated fat, almond butter is also a slightly better source of fiber than peanut butter. One tablespoon of almond butter contains 1.6 grams of fiber, while peanut butter has 0.8 grams. Most Americans don't get enough fiber in their diet, according to the Academy of Nutrition and Dietetics, so every little bit helps. Meeting your daily fiber needs, which ranges from 21 to 38 grams of fiber per day depending on your age and gender, might lower your risk of chronic diseases, such as heart disease, and make it easier for you to maintain a healthy weight, says AND. Almond butter has four times more vitamin E than peanut butter. Vitamin E is a fat-soluble vitamin known for its antioxidant properties. As an antioxidant, vitamin E offers protection to cells against free radical molecules. These molecules may play a role in the development of heart disease and cancer, says NIH. In addition to protecting your cells, vitamin E is also important for immune health. 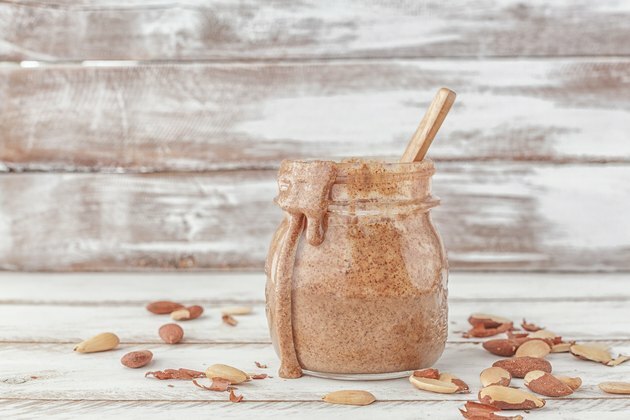 When comparing almond butter vs peanut butter, both contain minerals which are essential nutrients your body needs to function properly; they include calcium, iron, potassium, and zinc says KidsHealth. Of the two nut butters, almond butter is a better source of calcium, which supports bone health. Almond butter also contains more iron, important for the transport of oxygen in your body, and potassium, necessary for maintaining fluid balance in your muscles. Almond butter is also the winner with zinc content, which supports the immune system and helps prevent sickness, as well as aids in healing wounds. Peanut butter is still a healthy choice with a higher content of selenium and some B vitamins, including niacin, folate and vitamin B-6, than almond butter. Whichever nut butter you decide to buy, be a label-reader when it comes to sugar and salt content. Different brands vary in the amounts that are added. Look for a nut butter that is minimally processed without added sugars, hydrogenated oil and preservatives. Ideally, choose a natural product that contains only nuts and minimal salt to take advantage of the peanut and cashew nutrition that nut butters have to offer.